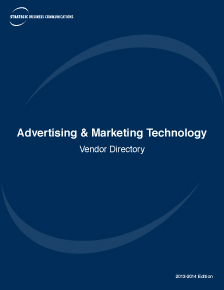 A controlled circulation vendor directory profiling all major providers of advertising and marketing technology products. Comprehensive worldwide coverage of the market from emerging private companies through to the major global market leaders. Distribution: 11,500 qualified executives involved with advertising and marketing technology procurement, including e-commerce, retail and consumer companies and senior Fortune 1000 and Global 500 decision makers.